DANIEL BLUE WILL GIVE YOU HIS CRABS! by KevinFreitas on 4/9/2010 @ 10:15am See everyone today! by FrostPark on 4/9/2010 @ 10:17am @Kevin - why isn't this showing up in the Feed? Only in the recent Chatter? by NineInchNachos on 4/9/2010 @ 10:25am you need a 'tacoma' tag sir! by marumaruyopparai on 4/9/2010 @ 12:20pm This man must have made a tremendous impact on his community. . . somehow. I mean in some way other than his music. by NineInchNachos on 4/9/2010 @ 1:14pm Today was fun. Lots of people. I think I even overheard a marriage proposal to Chalkmaster Andrea from a 'bus person' . 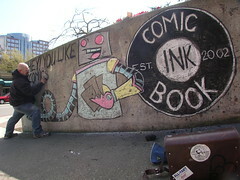 . . also classic Stowe ambition was on display as he tackled an entire wall in dedication to Comic Book ink. Meanwhile, I drew memorial spirit capture portraits to fallen tacoma hipster-personalities. by KevinFreitas on 4/9/2010 @ 1:41pm Great day out there indeed! Nice to see Andrea, Ariel and Dawn back in the competition and a special thanks to City Councilmember Boe for stopping by -- among others. Just in time for tomorrow's daffodil parade there is some great art right in the thick of it downtown. Here are photos of today's entries! Vote and tell you friends! by Mandiferous on 4/9/2010 @ 2:11pm So many awesome entries!!! I vote for Dawn's beautiful daffodil. 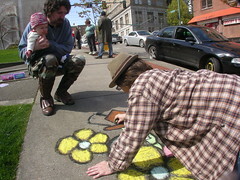 It was great to get back out there and chalk again, and tons of fun seeing everyone! by NineInchNachos on 4/9/2010 @ 2:27pm I vote for STOWE! by Altered Chords on 4/9/2010 @ 2:31pm I hearby vote for Stowe. by NineInchNachos on 4/9/2010 @ 2:40pm Joel has some great photos of adam the alien. I vote Stowe and I'm not shilling here. by Erik on 4/9/2010 @ 3:38pm Great work! by Jesse on 4/9/2010 @ 3:40pm One vote for Stowe here. by debivans on 4/9/2010 @ 4:15pm My vote goes to Dawn's Daffodil. by Joel 413 on 4/9/2010 @ 5:01pm I like the flower guns! my VOTE is for Adam the Alien. by KevinFreitas on 4/9/2010 @ 6:08pm Great to see the various daffodil entries! But, for color and quality I gotta vote for Dawn. See everyone next week! by Leischen on 4/9/2010 @ 6:24pm Everyone had stellar entries. I especially liked Andrea's and Dawn's. But for her first ever entry, my vote goes to Audrey. by ALT on 4/9/2010 @ 6:28pm Stowe's and RxR's entries are my favorites. Tough choice between the two. I VOTE for RxR's True Grit. Great portraits! by NineInchNachos on 4/9/2010 @ 8:47pm Thanks Andrea! Welcome back BTW. by Courtney on 4/9/2010 @ 8:47pm I vote for my daughter, Audrey. Thanks Leischen! by NineInchNachos on 4/9/2010 @ 9:11pm Dear Friends, it isn't too late to change your votes and pick me instead. See, I've had a lot of personal tragedy at the loss of Daniel Blue and The Living Sculpture "painter of trash"
Anyway, I thought I'd try. Thank you. God bless. by jamesstoweart on 4/9/2010 @ 9:28pm Well dang, after that... I vote for RXR. I have always been a sucker for pseudo-impassioned anguished pleas. by L.S.Erhardt on 4/9/2010 @ 9:33pm 10,000 apologies for my absence. Do have to earn a living, though. Many quality entries, but I gotta go with Stowe. by Voronoff on 4/9/2010 @ 10:12pm absolutely, magnificently, hilarious. thank you Grand Master R.R. for the kindly tear-soaked tribute. And just so you all know, I'm not in a Detention Center for controversial miming antics at the Tacoma Mall. That was last year. I'm actually in Timbuktu, following the trail of my illustrious ancestor Serge Voronoff, tracking down rare prophetic monkeys who can see into Tacoma's gritty future. by martha_s on 4/9/2010 @ 10:17pm I vote for Adam the Alien. Tacoma has two man shaped holes left unfilled in the city's collective soul. Daniel Blue, who I believe died in a hydrofoil accident. 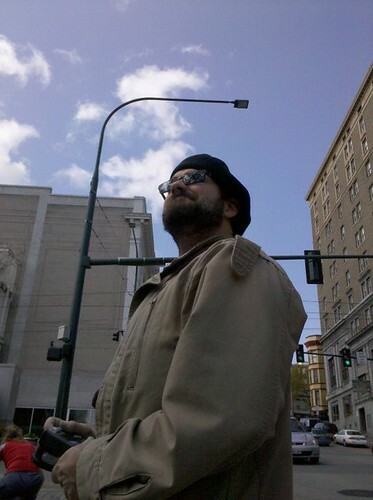 And Aaron Von Trotter (aka The Living Sculpture aka The Ghost Critic) who I believe is currently being held in the Northwest Detention Center. Anyway, moving forward, it is not important to dwell on their many many many many many failings... but instead let us cherish the few good memories we've shared in all our respective 'art' careers. Not all of you are 'real' artists or experienced professionals like me... and I apologize for the long run on sentences... but I'm typing this out with my thumbs on my blackberry... I'm driving to my boat house for a weekend vacation then later going to a party with Dale Cthihuly... anyway I'm doing you a big favor by taking the time to even write this.... 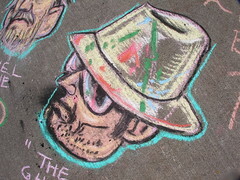 ANYWAY do me a favor and vote for me in the latest FROST PARK CHALK CHALLENGE EPISODE 02. This week I decided to draw what I call "TRUE GRIT" Spirit Capture Chalk Portraits of Daniel Blue and Aaron Von Trotter. Thanks for your votes! by ZottePark on 4/9/2010 @ 10:36pm I vote for Adam The Alien, great stuff! Heh the flowers are a nice touch. by shannnancy on 4/9/2010 @ 10:54pm I vote for Adam The Alien! by crockawaddy on 4/9/2010 @ 10:56pm I vote for the Alien that is an Adam. Shooting flowers instead of bullets is always fun. by Adam the Alien on 4/9/2010 @ 11:30pm Here's this week's Frost Park video! by marumaruyopparai on 4/9/2010 @ 11:33pm I cast my vote for RR Anderson not because I've been following his chalk art for quite some time now and consider myself a fan. And not because he is so desperate for recognition of this entry that he has threatened to de-friend those on Facebook who forsake him the vote that he so clearly feels he has earned this day. And certainly not because he is obviously an underdog, bravely and singlehandedly pitting himself against the legions of Stowe fans and members of the Adam the Alien fan club. I'm voting for RR Anderson out of sympathy. Take a good hard look at those spirit capture portraits people, and bask in the poignant anguish they were meant to evoke. There is a gaping hole left in RR Anderson's heart in the absence of Daniel Blue and Aaron Voronoff Trotter so large that only victory and recognition for his efforts can fill it (shower him with praise fine art patrons of Tacoma, or like a jilted lover, he may abandon you too). So if I wasn't clear, I vote for RR Anderson. by morgan on 4/9/2010 @ 11:59pm Beautiful! I vote for RR. by Adam the Alien on 4/9/2010 @ 11:59pm I've been debating who to vote for all day, but in the end I have to return to the first person I thought to vote for: I vote for Dawn. Her daffodil is simply marvelous, and she still showed up to our weekly chalktastic shindig even after mistaking the time and showing up an hour early. by Erik on 4/10/2010 @ 12:58am Congrats Stowe. And congrats to Adam for turning around a video so incredibly quickly. Unless I miscounted, it's a three-way tie. by NineInchNachos on 4/10/2010 @ 6:58am Hooray! Adam, RR and Stowe all get a Daniel Blue autographed windup crab! by Courtney on 4/10/2010 @ 7:07am Whee! The crabs are shared! by Crenshaw Sepulveda on 4/10/2010 @ 9:52am I'm seeing the basis for another episode of "From Here You Can't See At All". Thorax and Blue go to Pike's Place Market. by KevinFreitas on 4/10/2010 @ 11:46am @Joel: Hahaha, crap, that was funny. Congrats to the winners and, of course, to Tacoma for winning with through more art! by Erik on 4/10/2010 @ 1:35pm Congrats to everyone! It's a Frost Park love in. Congrats you three! So you're decided on sharing crabs? Or is there going to be a sudden death battle?